When it comes to Star Wars novelizations, there is one book everyone can agree is the best. Matthew Stover’s novelization of Revenge of the Sith set the bar. It took a good story, and made it better. That’s no easy feat considering that the Star Wars movies are such wonderful visual adventures. Books can be hampered in that they can’t match that visual splendor, let alone top great acting performances and matching that initial surprise of the film with its twists and turns. It’s not enough to simply translate that story to the written word. While it’s nice when an author adds a bit extra to make the time and money worthwhile to pick up the book version, it’s a whole different thing when the author transforms the novelization into a different experience. That’s the magic Mur Lafferty captures with Solo. Throughout the book, in every chapter, and on every page, there’s something extra to the story. Sometimes we get the viewpoint of a character that adds a different view of the movie. You get to dive into the head of Moloch, one of Lady Proxima’s enforces on Corellia, seeing a brief glimpse of his motivations. We get a look inside of the head of the security officer at the Corellia spaceport, the one who lets Qi’ra and Han go through the gate. There’s explorations of Beckett’s viewpoint, Dryden, and even Val and Qi’ra, which are probably the most rewarding. Many people wanted more of Val, and this book delivers. It dives into her internal musings as she thinks of past adventures her and Beckett went on. And it shows her viewpoint of her death scene, breaking down the logic of the choice she made. That extra insight is everywhere in the book, and it adds to the story of the film, making it that much better. In addition to different viewpoints, there’s added scenes that take place between the moments in the movie. The book explores the mission Han was on that led up to him having to boost a landspeeder. It goes over Han’s stint in the Imperial academy and how he wound up getting booted to the infantry. The book explores more of the combat on Mimban and shows off the fourth member of Beckett’s crew, Korso, who is only briefly glimpsed in the movie. There’s a nice extended chat between Qi’ra and L3-37 that touches on a very interesting nerve with Qi’ra, her restraining bolt that keeps her with Crimson Dawn. The book even ends with an awesome epilogue that ties Enfys Nest to elements of Rogue One. With all the extra story bits in the book, readers get to learn more about the characters. There is more about their backstories, their motivations, and their desires. For some, it will help plug in some of the gaps and shortcomings with the movie. In the book, Beckett has time to grieve the loss of his friends, and lament the lack of time to grieve more. For fans who loved the film, there’s more to enjoy with the book. There’s precious explorations of Chewie’s thoughts which are always obscured in the films since he speaks a different language. There’s extra details on what happened to Qi’ra in the years between here being left on Corellia and eventually meeting back up with Han. It reveals how she wound up with Dryden, and some of the things she was forced to do. It also helps explains her decision at the end of the movie to stay with Crimson Dawn. 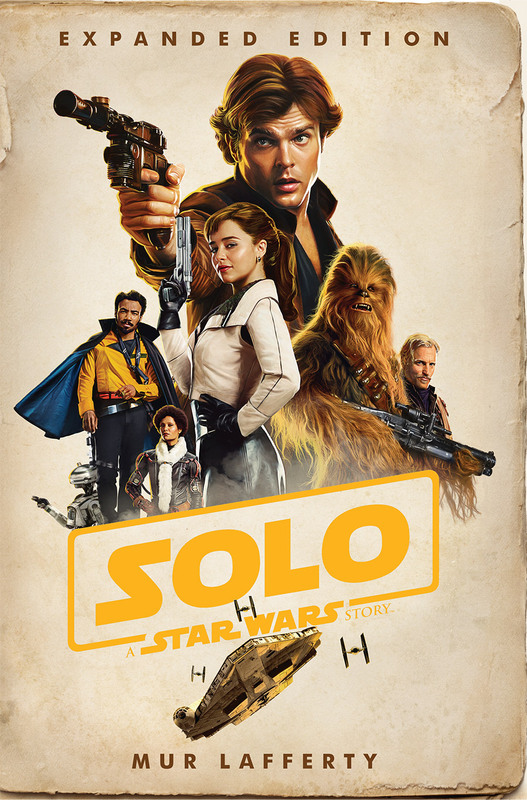 So whether you’re looking for answers or another fun way to explore the movie, the Solo novelization delivers. It’s great story that takes the time to add a lot to the story of the film. From different viewpoints, new scenes, and explanations for the events that happen in the movie, the extra content creates a completely new experience. For Star Wars fans and Solo fans, the Solo novelization is a must read. I highly recommend it and give it a five out of five metal bikinis.